have to meet up. No office visit is required. Your online divorce can be process via E-mail and USPS. team or to provide one-on-one personal service, then APS CAN HELP! public, in an effort to save you time and money! 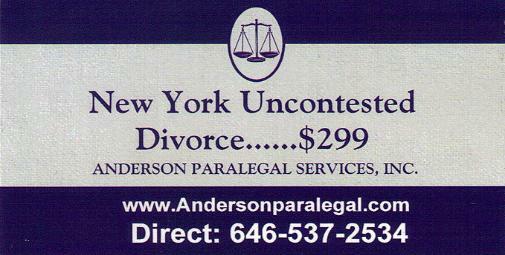 assist you in your matter, feel free to contact Anderson Paralegal Services. reasons why you should choose the services of APS! At No Additional Cost To You (within the NYC area) click here for specific info.